In Roman mythology, Janus is the god of gates, doors, doorways, beginnings, endings and time. He is commonly depicted with two faces, one facing forward and one backward, representing foresight and hindsight. When Joel came to me with the proposal to write a piece for his Master's recital at the University of Michigan, the plan of his programming intrigued me. My composition was to be inserted in between middle movements of two other pieces, as all multi-movement works were to be spread out and intertwined, and then performed without interruption. Right before my work, he programmed the second movement from the Bach g minor sonata (played on marimba), a four-voice fugue. I recorded Joel playing this fugue as well as excerpts from the third movement of the sonata, which would follow my composition. 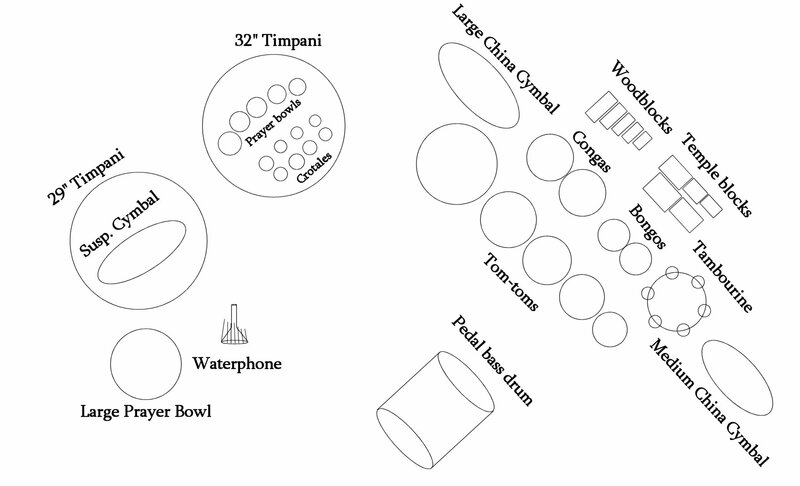 I also recorded crotales, prayer bowls, gongs, and cymbals played on top of timpani, and also a waterphone. The work is cast in three sections. The opening third is a swirling, dreamy fantasy that utilizes crotales, prayer bowls, and a suspended cymbal placed on timpani. The electronic track begins with a G pedal, rising out of the final chord of the Bach fugue. In addition, it contains samples of the Bach fugue that come into and out of focus fleetingly. The middle section begins with punctuations on the drums and kick bass and then settles into a four-voice fugue on drums and temple blocks, with a subject that imitates the Bach g minor fugue subject in rhythm and contour. The final third returns to the mood of the opening, but over a B flat pedal. The electronic track looks forward to the third movement of the Bach sonata, the Siciliana, while the instrumentation returns to the crotales and prayer bowls. While this work looks forward and backward on the program for which it was written, one may also interpret this hindsight/foresight in a more general manner. Its references to the baroque through direct quotation of the Bach and through use of a fugue, complete with prelude-like material, expositions and episodes acknowledge the past, while its use of electronics and its varied percussion scoring look towards the future.